Your Spiritual Path - When we are born into this existence, we’re tossed onto a sea of physical demands, earthly ambitions and responsibilities, drives, and temptations that overtake us with a compelling and distracting combination of desire and necessity. Yet in the midst of the everyday tumult, there is the still, small voice of the spirit calling us on to a greater quest, cracking open the door to the higher transcendent path that waits when we are ready for the journey. 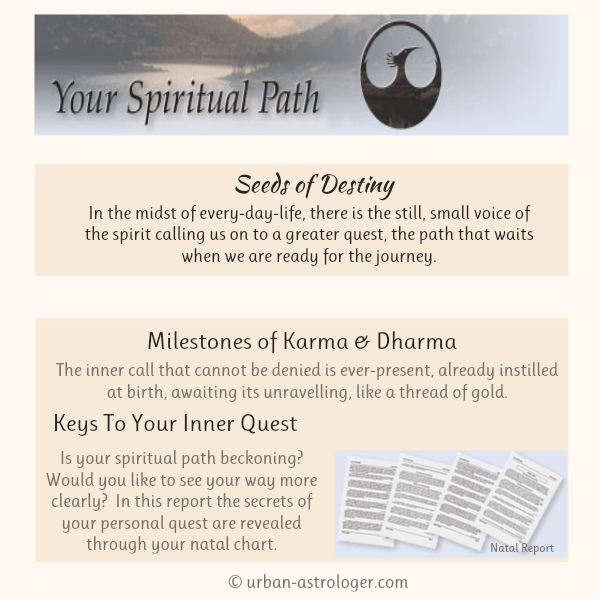 Click here to fill out birth data and order your Spiritual Path Report now. Is your spiritual path beckoning? Would you like to see your way more clearly? As strange as it may seem, the very moment you entered the world’s confusion – the instant you were born – contains within it the kernels of your greater calling. In this unique, compassionate report the secrets of your personal quest are revealed through your natal chart. Just as the planets, signs, and houses can paint the doubts, conflicts, and resistance that you must face every day, at the same time they possess a higher level that describes the special opportunities tailored for you in the spiritual world. Within the struggles that Mars, Saturn, and Pluto sometimes bring ... are the milestones of karma and dharma that mark your ascending road through many lifetimes to the present and upward to the future. The inner call that cannot be denied is ever-present, already instilled at birth, awaiting its unraveling, like a thread of gold. This report delves into your birth chart to find those unquenchable points of light waiting to illuminate your personal path. These seeds of spiritual destiny are given to you alone at birth, to nurture and unfold into the flowers destined to surround you as you move along your path. Here’s where to look for them – they are yours for the asking.